Since being introduced in 1971, Humminbird has made quite an impact in fishing electronics as they’re lineup of fish finders and depth finders are continually mentioned among the best. 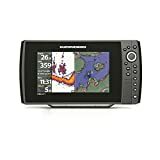 Humminbird fish finders are mentioned along with the leaders in innovative of Side imaging technology which give them the consumer confidence that we’ve come to expect. Humminbird fish finders and depth finders speak for themselves which have helped make them consistently some of the top-selling models out there. Whether you’re looking for a small, compact model or one that boasts all the bells and whistles, you’re certain to find one tailored specifically for you in the review below. The following details the Top 5 Humminbird Fish Finders in 2018 while giving you everything a consumer needs to know. 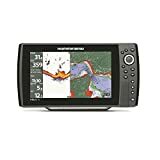 Claiming the top spot in this review is not only the best Humminbird fish finder out there, but easily one of the best from any manufacturer. Scoring huge with a perfect 10 out of 10 and sporting perfect scores from consumers, the Helix 9 sonar gps fishfinder is a great buy. Boasting a large 9-inch color display with a wide screen viewing angle and a resolution of 800x480v. The Humminbird Helix 9 fish finder is a pro grade model, but simple enough to use even for the newest fishing enthusiast. Featuring Dual Beam PLUS Sonar, 4000-watts PTP power output, GPS chartplotting, and Humminbird’s own ContourXD map. There’s even an ethernet port giving you networking capability giving you more options than the standard fish finder. Another top-rated sonar fish finder is this Helix 10 which is highlighted by an impressive 10.1-inch color display. The wide screen display is easily one of the best in its class giving you the perfect balance of beauty and performance. This model puts you right where you want to be while displaying all the metrics you need on an ultra-clear, intuitive display. The Humminbird Helix 10 Sonar GPS Fishfinder has all of the top features including GPS chartplotting, Humminbird ContourXD map, Dual Beam PLUS Sonar, Imaging sonar, Auto Chart Live and power output of 4000-watts. Out of the box you’ll get the chartplotter receiver, Instant Access Preset Buttons, dual card reader, and you can add deep water transducers for more watts. Sometimes it takes a special fish finder to give fisherman what they want and this model specializes in ice fishing while taking the entire sport to the extreme. The Ice Helix 5 is a sonar GPS fish finder which features a 5-inch color LCD display. Upgraded with modern technology including a micro SD card allowing you to expand on its factory capabilities. The Humminbird Ice Helix 5 is aggressively priced and comes with all-positive reviews from consumers. Relying on what’s proven to work which is highlighted by Unimap cartography and a brilliant color display with 256 colors. Other features include GPS Chart plotting, Dual Beam PLUS Sonar, 400-watt output, and works even under the harshest of environments. Another fish finder from Humminbird is the Ice Helix 7 which outperforms the competition in water and ice fishing conditions. This extreme fish finder boasts a larger 7-inch color LCD display which is heralded to boast the biggest and brightest display of any ice fish finder out there. Everything is controlled on the display which shows you exact depth, terrain, fish while giving you 8x digital zoom. The Ice Helix 7 Sonar GPS fish finder is highlighted by the 7-inch display with a 480×800 resolution. Outfitted with sonar along with dual beam technology giving you a wider, clear view underwater. The precise GPS system, clear view technology, and accurate sonar which gives you a precise look below are only some of the many things that consumers have raved about. This PiranhaMAX appeals to users looking to get on the water in class and not spending a fortune. The 195C is a dual beam fish finder with a 3.5-inch color display. The display is bright enough to give clear views and doubles as a fish finder/chart plotter combo. Boasting 320 X 240 pixels, you can rest assured you’re getting views of everything you need underwater including fish, obstacles, and terrain. 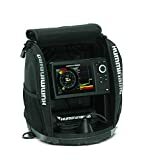 The Humminbird PiranhaMAX 195C is a great buy at this price and gives you everything you need which comes in highly recommended for regular fisherman and enthusiasts. Featuring an easy to use interface which is simple enough for beginners, but feature rich which appeals to regular anglers. Feel free to leave us a comment below if you have any unanswered questions or share your experience with any of the Top Humminbird fish finders this year with the rest of the community.